Laminar Air Flow Workstation should have a Horizontal Airflow System. Constructed of GI with Powder Coated & SS 304 Grade Constructions, which should be termite and insect proof, fire and weather resistant covered with high quality, high pressure white laminated sheet from outside and painted with corrosion resistant and antifungal epoxy paint from inside should have self supporting structure and requires no additional stand neither for the cabinet containing motor Blower unit, HEPA and profiles nor for the cabinet containing motor Blower unit, HEPA and profiles not for the work table. Worktable top mounted with SS sheet of high grade. The motor blower unit is mounted on anti vibration mounts to keep the surface vibrations at minimum. 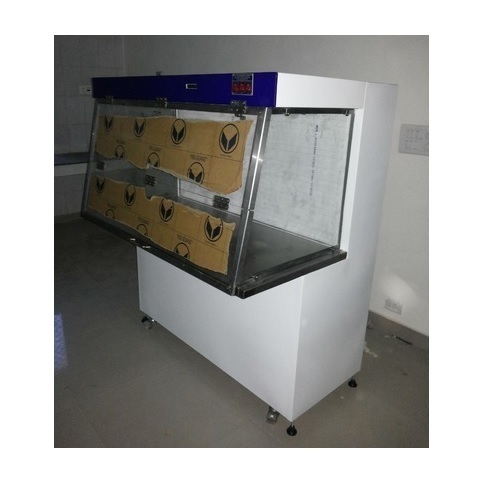 Established in the year 2007, we are one of the leading manufacturers, exporters and distributors of Clean Room Equipment and System in India, "Bio-clean Air Devices & Services" is a name to trust upon. We have been offering a large array of Horizontal, Vertical & Ceiling Suspended Type Laminar Airflow Systems, Class I, Class II A1, A2, B1, B2 & Class III Biohazard Safety Cabinets, Powder Sampling & Dispensing Booths, Air Shower Entry Systems, Inoculation Hoods, Static & Dynamic Pass Boxes, Wet Chemical Work Benches, Grossing Work Stations, Positive Pressure Modules, Mobile Type Clean Air Tent / Modular Type Clean Rooms, Static & Dynamic Sterile Garment Storage Cubicles, Conventional, Bye-pass & Auxiliary Fume Exhaust Hoods and Ductless Fume Hoods etc. Since our establishment in the year 2007, we have been offering the best to the clients at best prices and superior quality. All our products are manufactured using high technology parts and finest grade raw material that are sourced from certified vendors only. Easy installation, maintenance free design and high durability are the best features of our range that have increased their demand in both national and international markets. To provide complete satisfaction to the clients, we have been offering customization solutions with after sales services to them as per their exact requirements. With our honesty and transparent business activity, we have received international certifications that include US Federal Standard 209 E, ISO 14644-1 and IEST-RP-CC-002-2. Backed by an experienced team of experts, we have achieved the turnover of 1.5 Cr in the last one year. In addition to this, our high technology machines help us to manufacture around Rupees 15-20 lakh per month valuable units. Our high end products are designed to offer qualification protocol such as DQ, OQ, IQ, and PQ documents. Moreover, our documentation & certificates will be recommended for appropriate approval agencies of like NABL Accreditation, WHO-GMP & GLP, US-FDA, MHRA from UK, TPD of CANADA, ENVISA of the BRAZIL and TGA of Australia for approval. We are looking queries from all over the India, Asia, Europe & Africa.